New year’s eve is approaching and apart from the food and drink, the Vasilopita is the center of attention. Vasilopita pronounced vah-see-LO-pee-tah, is the Greek lucky new year’s cake that has a coin hidden in it and is cut at midnight. It is tradition for each family to have their own vasilopita and a piece is cut for each family member. If the coin is in your piece you supposedly have good luck for the rest of the year. I remember all the kids were so excited when vasilopita time came, we all wanted to get the lucky coin. Once we had our piece we would break it up to see if we had the coin, if not we still got to enjoy the tasty cake. Nowadays, I enjoy it much more the next day with a cup of coffee. Vasilopita is not only cut in families, businesses, clubs, associations and ministries all have vasilopites that they cut during the first few weeks of the year. The concept of the coin applies to all the employees and members and is attached to a larger gift such as a television. On New Year’s Eve when the clock strikes 12, after everyone wishes each other a new year it is time for cutting the vasilopita. Traditionally there is a religious aspect, so the host of the house is the one who cuts the cake. The first piece is for Christ, the second for the virgin Mary, the third for the house and then follows a piece for the hosts, following by the oldest relatives and moving to the youngest. If a family member is away on a trip they are also included. We also included our pets. If you are celebrating New Years’ s with friends and you are cutting a vasilopita, they all should get pieces. Anyone who is present at the gathering should get a piece. Vasilopita is not only cut in families, but also businesses, clubs, associations and ministries. All have vasilopites that they cut during the first few weeks of the year. The concept of the coin applies to all the employees and members and is attached to a larger gift such as a television. Typically a gold plated coin or a silver coin will be inserted in the Vasilopita, there are coins made and sold just for that reason. Whoever gets the coin, not only gets to enjoy good luck for the whole year, but they also get some sort of gift such as money and/or a charm. 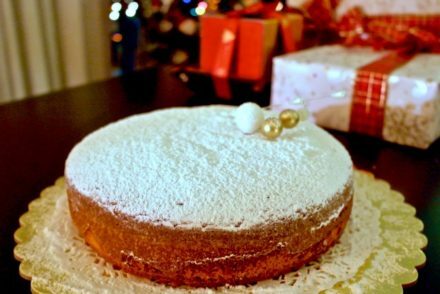 Vasilopita is a moist cake made with ingredients everyone has at home: sugar, flour, eggs, milk and orange. There is another more bread-like version made with yeast, which is a bit, more time consuming, but in our family we make and like the cake version. 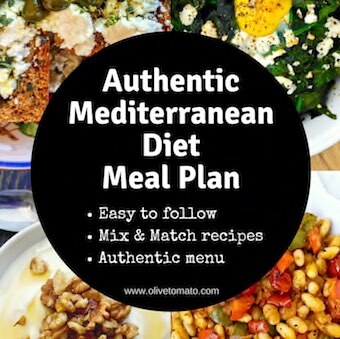 Now obviously this is not a particularly healthy recipe, what with the butter, but you usually enjoy only one small piece and if you have leftovers you can enjoy it over the next few days with coffee or tea. This vasilopita recipe is slightly lighter than the traditional Vasilopita, and is the one my mom has been making since I was a little girl. It is a slightly modified version of the one in the Hrysa Paradisi cookbook. So while it contains the basic components sugar-flour-butter, it uses orange juice instead milk, it contains less eggs than the typical vasilopita with only 3 eggs as opposed to 6 eggs in other recipes. I also have modified it a bit more by reducing the sugar by ¼ cup, and you could probably reduce it by another ¼ cup without affecting the texture too much. The baking can be a bit tricky, as this cake is a bit moist. Don’t open the oven before it is ready and test with a toothpick or knife all the way to the bottom of the cake to make sure it is done. 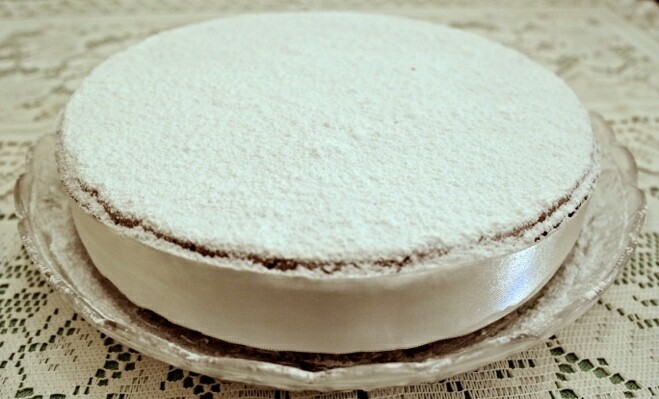 You can take a small coin, wrap it in aluminum foil, dip it in flour and put it in the batter, or you may once the cake is baked, push the coin from the bottom of the cake while the cake is slightly warm. *Check out this recipe for a lemon flavored vasilopita made with olive oil instead of butter. 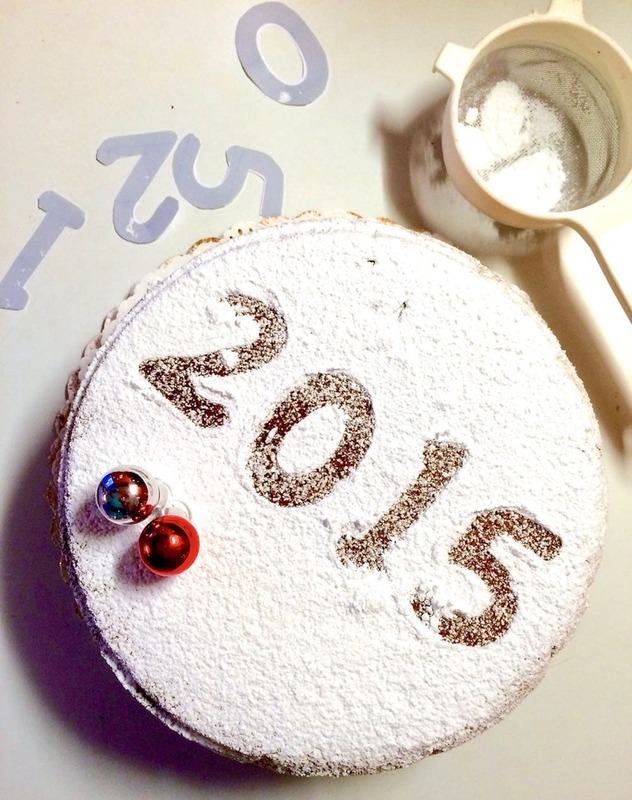 A traditional Greek Lucky New Year's Cake with a lucky coin made with sugar, butter and flour. Preheat the oven at at about 350 degrees Fahrenheit (175 degrees Celsius). Add the orange juice, vanilla and orange zest- mix with a mixer about 2 minutes. Whip the eggs in a small bowl and add to the butter mixture and mix for another 2 minutes. In another bowl mix the flour and baking powder and add to the wet ingredients and mix for 2 minutes at low speed-do not over mix. If you are adding the coin in the batter, add it now. Pour batter (it will be thick) in the pan, smoothing the top with a spatula. Bake for about 45-60 minutes. Check with a thin sharp knife in the center, it should come out clean. Release the pan and turn cake upside-down on another plate. If putting the coin in now, wrap in foil and push it through the cake. Turn cake back on top and sprinkle with powdered sugar, you can also even out the top of the cake slicing with a long knife. You can make a design using paper cut outs or using almonds or raisins or you can ice the cake with a simple icing made with powdered sugar and water. Make sure you have a lucky charm for the person who will get the coin in their piece. 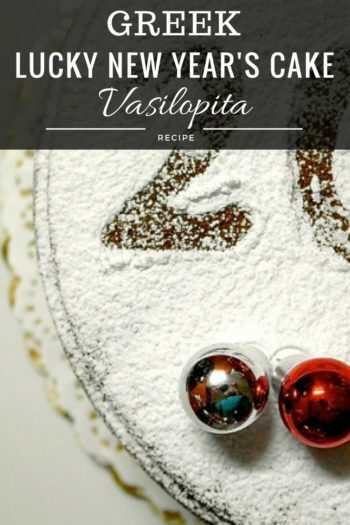 Great Vasilopita recipe. I’m baking some for my daughter’s greek school class and loved how easy this was….and fewer calories! Glad I came across your site. 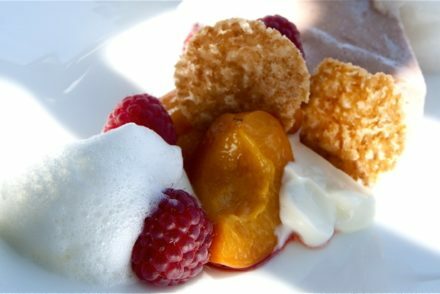 sounds good, will be attempting this receipe this afternoon. Your recipe calls for 2 Tablespoons of baking powder. Did you mean 2 tsp? Could there be a mistake in the recipe? Hi Kristin, there is no mistake, it is 2 tablespoons. What’s the calories for this? Thank You Paris. Happy New Year to you too! self raising flour without putting in the baking powder? Do you think it will work? It should work, but you would have to adjust the amounts. I have not tried it so I cannot suggest the amount you would need to replace it with. After 2 failed yeast option Vasilopitas I have now resorted to your yeast-free version In the oven as I type!! Here is hoping it works. Xronia polla kai kali xronia! Thank you Barbara! Have a great year! Used this recipe this year and I can say this is the best one I’ve done. Multiple complements. Seems lighter than previous ones, which results in an little less guilt when eating it! Thank you very much for sharing this with us! Kali Xronia! Thank you Dean! 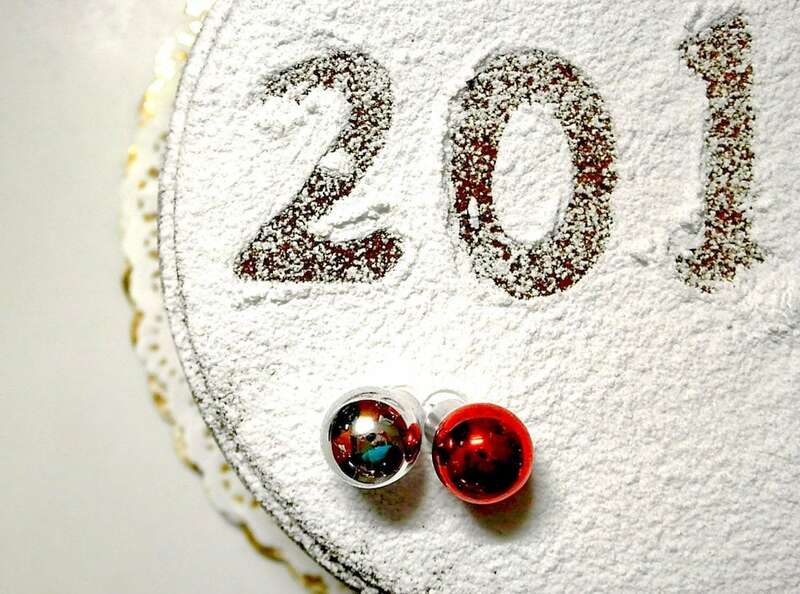 Have a great 2019! 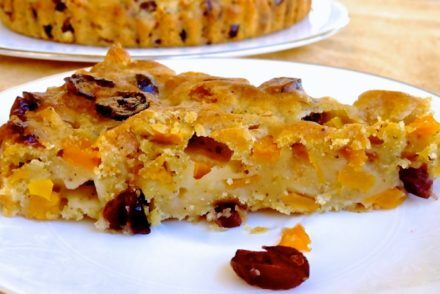 Elena, thank you for sharing your recipe! I quickly made this at 10pm last night to cut this morning in Sunday school class today. It was a bit with the kids and parents too! Thanks again and Happy New Year! Καλή χρονιά! I’m so excited to try this – I just now remembered I have to make this cake for my son’s school. (Why oh why do I sign up for these things! LOL) and was scrambling for a recipe. Will give this a try. The comments look great and I love that you used orange juice instead of milk. Neat!